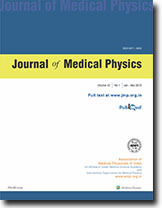 Ionization chamber and solid-state dosimeters have been used to investigate the beam profiles of 6 MV X-ray beams from a medical linear accelerator, with special attention being given in the penumbral region. Measurements were done in water for field sizes from 5 cm x 5 cm to 25 cm x 25 cm and at depths of maximum dose (Dmax) to 15 cm. The field widths at 50% of central axis (CR) dose, measured by diode, were found to be larger than those measured by ion chamber for all field sizes and at all depths, except for field sizes less than 16 cm x 16 cm and at depth of (Dm,). The penumbral widths defined as the distance between 8Q% and 20% of CR dose, measured by diode were sharper than those measured by ion chamber, except for field sizes Larger than 15 cm x 15 cm and at depths greater than 10 cm. Comparison of beam profiles and penumbral widths are Presented. A series of measurements of absorbed radiation dose to the lens of the eye, given during certain C.T. examinations was performed. Results obtained demonstrate the variation of dose with technique employed. Four current generation C.T. scanners installed in and around Brisbane were examined in this study. Measurements were made using a small waterproof ionization chamber and a purpose built phantom. The study was undertaken to determine the level of radiation dose delivered to the lens of the eye during certain routine C.T. examinations (i.e. axial orbit) with normally used scanning parameters on a variety of current generation C.T. scanners.